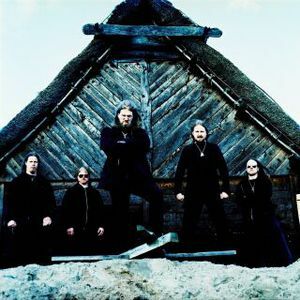 Deeply rooted in melodic death metal with lyrics centered around Viking history and Norse mythology, Amon Amarth (formerly known as SCUM) was formed, with the arrival of Johan Hegg as the new vocalist, in 1992 in Tumba, Sweden, a southern suburb of Stockholm. They began writing material with lots of melodies, harmonies and lyrics about Vikings and the norse Pantheon. In summer 1993 they entered Lagret Studio to record the Thor Arise demo, which would later on appear on the bonus disc of the album Versus The World. The band continued rehearsing and writing stronger material and again entered the studio. The result was the second demo, The Arrival of the Fimbul Winter. This time the band was much more satisfied with the sound and songs and launched it to an unsuspecting underground. The response was overwhelming, quickly selling out of the first pressing and secured them a one off deal with Singapore's Pulverised Records. This time they decided to use Abyss Studio, owned by Peter T&auml;gtgren of Hypocrisy, and during five days in November 1995 the MCD Sorrow Throughout the Nine Worlds was recorded. The five track recording contained three new songs plus two re-recorded tracks from the band's second demo. The MCD was released in April 1996 and continued the band's build to world dominance. June 1996 saw the exiting of drummer Nico who was quickly replaced with Martin Lopez. During this time labels began to show interest and after much consideration the band chose to sign with Metal Blade. In March 1997, Amon Amarth again entered Abyss Studios to record their Metal Blade debut Once Sent From The Golden Hall with Peter T&auml;gtgren. The result proved that they were destined to become a force of fury in the Swedish death metal scene and beyond. After the recording of this album, guitarist Anders Hansson quit just a month before their first major tour with Deicide, Six Feet Under and Brutal Truth in June 98. They quickly recruited Johan S&ouml;derberg to make the line-up complete. Fredrik Andersson joined viking metal band Amon Amarth in 1998 after Martin Lopez left to join Opeth. The line-up was now solidified. The Avenger was recorded at Abyss Studios Sweden February to March 1999. Produced by the band, the seven-track album is a lesson in pure Viking aggression and brutality blurring the line between death and black metal. The tour following this release was the X-mas massacre festivals, headlined by Morbid Angel. In November 2000 the band entered The Abyss Studio for, as it would turn out, the last time. This time they recorded the album The Crusher (released in 2001). Living up to its name, some consider the album to be the most brutal album the band has produced so far. This release gave Amon Amarth the opportunity to tour a lot more than before and right after the recording they went on their first headlining tour through Denmark and Germany with Purgatory and Seirim. That tour ended up with great success and they also managed to be the first metal band entering the German stages for the century. 00.05, 01 of January in 2001 in Guben. Then they went on the No Mercy Festivals 2001 with bands like Marduk and Vader. In the fall of 2001, Amon Amarth was supposed to support Marduk on their American tour, but due to the events of September 11th, that tour was postponed until January 2002, and if that wasn't enough, Marduk couldn't make it over to the States. So Amon Amarth got to headline their very first US tour, supported by Diabolic from Tampa, FL. The tour was a huge success, but unfortunately the tour agency decided to cut the tour short with one week. Returning to Europe, Amon Amarth was offered the possibility to headline their own full European tour, and in April 2002, they went on the road together with Swedish "gore-masters" Vomitory. During the tour, the band kept writing new material for an upcoming album. August 2002 started with the band's second appearance at Wacken Open Air. Approximately 12,000 people saw the show and the response was overwhelming. Almost going straight from Wacken to the Studio, Amon Amarth began recording their new album, Versus The World, on August 7th. This time, however, the band had to use a new studio, since Peter no longer produces or records any bands, except his own, in his studio. The choice fell on Berno Studio in Malm?, and it turned out to be a great choice. Berno Studio has a great reputation in the scene and Amon Amarth found it to be very easy to work with both Berno (owner, engineer) and Henrik (engineer). Recording in a new studio gave new dimensions to the band's sound. During the recording, the band managed to squeeze in a trip to Germany and the Summer Breeze festival, where they made a successful appearance. Their fifth album, Fate of Norns, was released on September 6, 2004. On September 22 2006 they released their sixth studio album, With Oden On Our Side. Johan promised that the new album would return to the old sonority that brought fortune to Once Sent From The Golden Hall, which is considered by many to be the best album of the Amon Amarth discography. "Twilight of the Thunder God" was released on the 17th of September in Sweden, the 19th of September in D/A/CH/I and the 22nd of September in the rest of Europe. North American release date is September 30. The album released to large critical acclaim including "Album of the month" in Metal Hammer. The band is currently on tour and is due to hit several festivals in 2009. On November 30, 2010, Amon Amarth confirmed their next album would be titled Surtur Rising and will see a Spring of 2011 release date. The drums have been recorded at Park Studios, while bass and guitars have been recorded at Fascination Street Studios. According to the band's website, a release date has been set for March 29 in the U.S. They will also be embarking on a 4 month world tour with Children Of Bodom and Ensiferum, among others in March - June 2011. On January 27, 2011, Metal Blade Records released the first single off of the new album entitled "War of the Gods" on YouTube.